A new revolution in the world of journalism is about to begin. Google has announced its "News Lab" for journalist and news agencies. Aim of News Lab is to provide different tools to journalist that can boom up a revolution in this field. The News Lab, a new effort at Google to empower innovation at the intersection of technology and media. and through programs designed to build on some of the biggest opportunities that exist in the media industry today. From Maps to YouTube to Fusion Tables to Earth to Search, Google is offering many tools that newsrooms can use in their reporting and storytelling. Now, journalists around the world can access tutorials on these products created specifically for newsrooms. 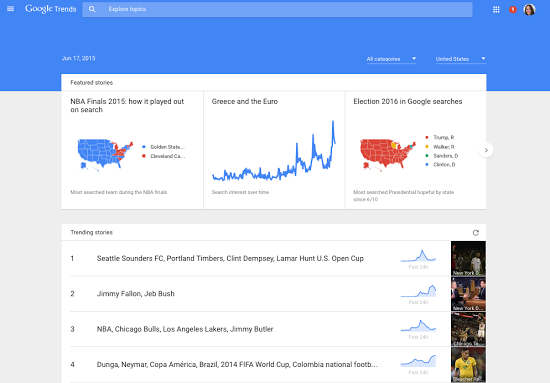 Recently Google announced an update to Google Trends platform. The new Google Trends provides journalists with deeper, broader, and real-time data, and incorporates feedback Google collected from newsrooms and data journalists around the world. Google is also helping newsrooms around the world tell stories using data, with a daily feed of curated Google Trends based on the headlines of the day, and through partnerships with newsrooms on specific data experiments. One of the opportunities google focused on is increasing the number of media startups in the marketplace. Google will provide financial support and mentorship from Google engineers that will help these organizations expand their impact to more startups around the world. Google is also holding a series of TechRaking summits with the Center for Investigative Reporting: hackathons focused on developing new investigative tools such as drones, online databases, and more.